Although MS is classified as one disease, the way that people experience MS can be drastically different. It’s almost like no two people have the same MS! While the symptoms and development can vary widely, it’s important to understand the 4 types of MS to know the likely course and potential treatments for your MS. Most people diagnosed with MS never become severely disabled, so understanding your course can help ensure a higher quality of life with MS.
CIS is the first time that neurologic symptoms rear their head and cannot be tied to fever or infection. The episode has to last for at least 24 hours and can be characterized by one symptom or several. If brain lesions similar to that for others with MS are found in an MRI there is a 60-80% chance of another episode. The most common form of MS, about 85% of people with MS are initially diagnosed with RRMS. This type is characterized by alternating periods of relapses (also called attacks, bouts and exacerbations) and periods of partial or complete recovery. There is no real rhyme or reason to how symptoms come and go, or the frequency of that process, or which symptoms become permanent. You might not even notice an attack as not every brain lesion comes with symptoms. 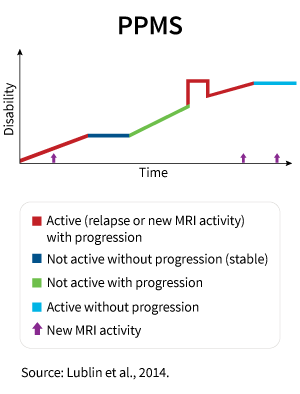 Most people diagnosed with RRMS will eventually progress to SPMS, characterized by a progressive worsening of neurologic function as sustained symptoms and more disability accumulate. 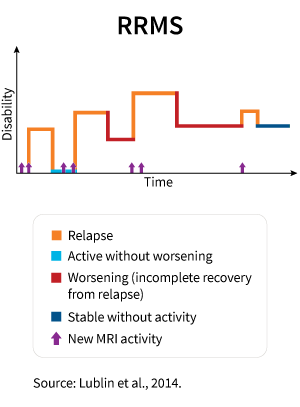 On average the transition from RRMS to SPMS occurs 10 to 20 years after initial diagnosis, but for some it occurs quite quickly while for others never at all. Whereas most people move from RRMS to SPMS, PPMS only occurs for about 15% of those diagnosed with MS. In PPMS neurologic function worsens and symptoms accumulate without periods of relapse and remission. Typically appearing in those age 40-60, the first symptom often is difficulty walking which may include their feet dragging (or foot drop). The underlying science and causes of PPMS may also differ from RRMS. Whereas in RRMS the immune system attacks the nerves’ myelin, in PPMS the nerve fibers gradually deteriorate. Occuring in only 5% of MS cases, the disease steadily worsens from the outset with acute relapses but no remissions. People with PRMS more often become disabled because they have periodic attacks that dot the building progression of symptoms. While it is important to understand the different forms of MS, a big takeaway is that everyone’s MS is different. Even for the same type of MS the symptoms that one person experiences can vary dramatically throughout the course of the disease. That’s why you need to listen to yourself and your body by doing the things that make you feel better in the course of your MS. While we cannot be there in person for many of you, Rekinetics has developed programs that can be delivered virtually and make an immediate impact in your quality of life in only 5 minutes a day. You can get to those options by clicking here - Start Now - or fill out a form on the Contact Us page to schedule a time to talk with our team.